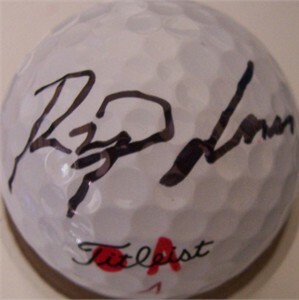 Titleist Pro V1x golf ball used by Ryan Palmer during a tournament round at the 2012 Humana Challenge PGA Tour event near Palm Springs, autographed by Palmer. Has markings in red. With certificate of authenticity from AutographsForSale.com. ONLY ONE AVAILABLE FOR SALE.